ideas that are dear to my heart. What can you do with old pillows? Or, the hidden challenges of co-housing. What can you do with old pillows? They say to replace pillows every twelve months for health reasons. That makes for a lot of leftovers. We are two households combining gradually. 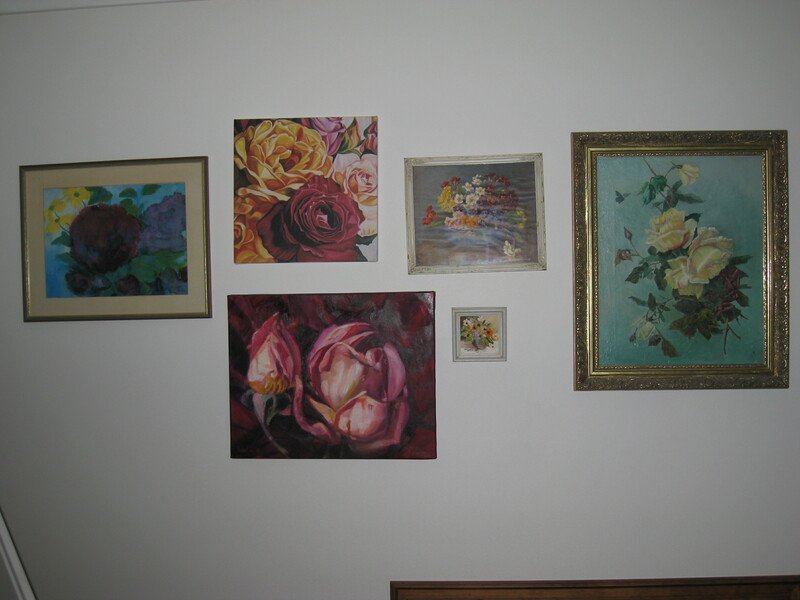 A corner offering sanctuary, my old house. I’d been living by myself. My house had three bedrooms and two bathrooms . I was working in a permanent job with a regular income. Not a normal thing in my life, so I had lots of fun buying furniture, linen, bedding, cookware … all the accoutrements of a “proper” lifestyle, after many years of making do and never having enough. 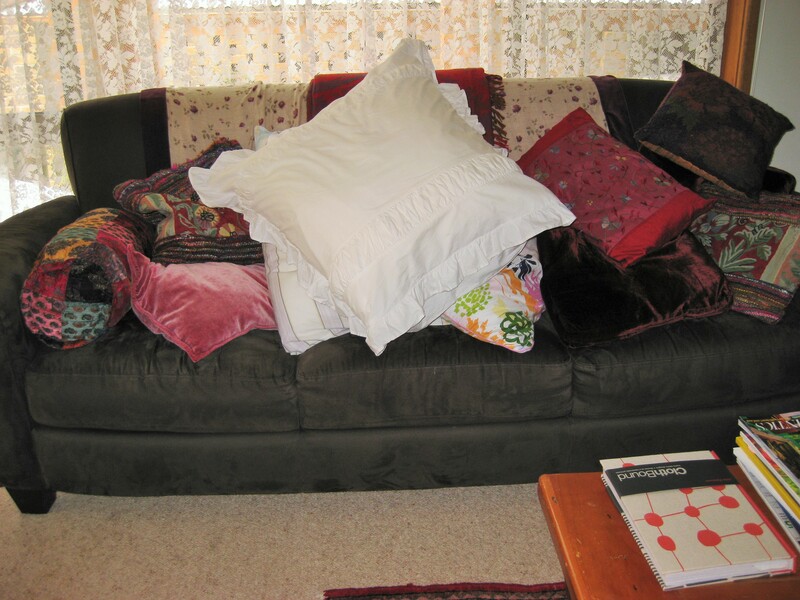 I was able finally to have enough, perhaps even, to have abundance – lots of pillows and lots of stuff. I loved it . I enjoyed being able to buy another set of towels or good bakeware or whatever took my fancy. My co-houser has brought her furniture, linen, bedding, cutlery, and …. So here we are now with… excess. There must be something you can do with pillows. All the couches (and yes, we have several couches, four in fact), have European pillows, standard pillows and cushions, covering them. 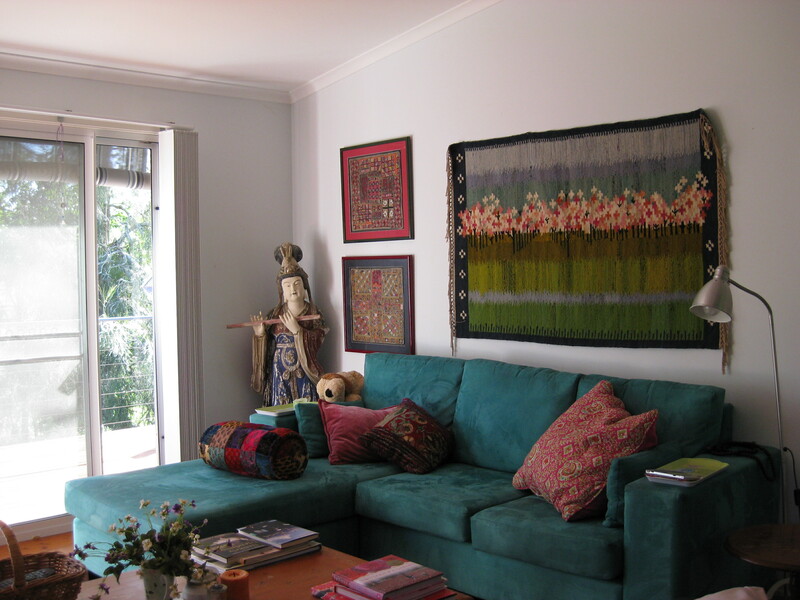 I’m interested in the way visitors will perch on the edge and stay there (there’s no room unless they move some clutter), looking uncomfortable and ill at ease, but ignoring admonitions to ” move the cushions, they’re only thrown there, you won’t disarrange anything!” The cushions and pillows aren’t placed there for decorative reasons, but as somewhere to put them. couches are for holding cushions and pillows. 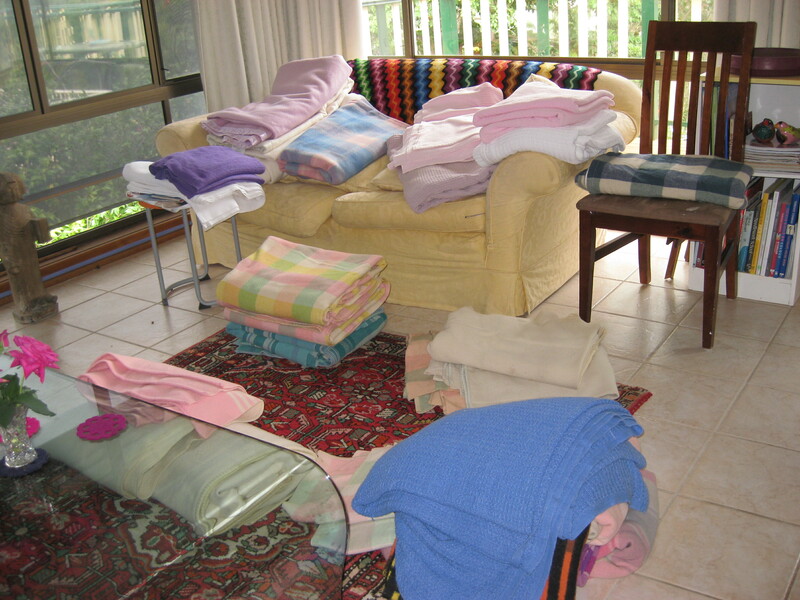 And excess quilts, blankets, cutlery, saucepans, cupboards, tables – the obvious answer – get rid of them! But who wants leftover pillows or quilts or blankets or? And how do we choose what to keep and what to give away? Who wants to give away their cherished blankets, the ones their granma gave them when they first left home? Which set of saucepans do we keep? Do you begin to see the hidden depths of what may have appeared to be simple? Back to the original question- I hold the belief that excess pillows are very useful. They can be cushions, or pillows for picnics, or beds for stray animals, or heaped on the deck or … I find it difficult to give away something that is inherently useful, someday I may need it. And no, I ‘m not a child of the Depression era. And yes I do save plastic bags-I hate to buy plastic when the earth and all her living creatures are being poisoned by micro plastic! How can I knowingly add to that huge plastic continent in the middle of the Pacific? Need I mention here that I am plagued by the fear of scarcity? What if my co-houser discovers she hates living in the country and moves back to the city? There won’t be enough pillows and blankets, saucepans and cutlery to go round! Now my co-houser is much better at giving things away (perhaps reckless?). A wonderful colonial silky oak cupboard went to the removalist. Her reason? There’s nowhere for it here. I would have hung onto it, hoping that a home would be found for it. That’s why there’s a red cedar chest of drawers sitting downstairs. So far there is nowhere for it, but my father adored red cedar. He found this one at an auction and treasured it. Throwing it out feels disloyal to his memory. 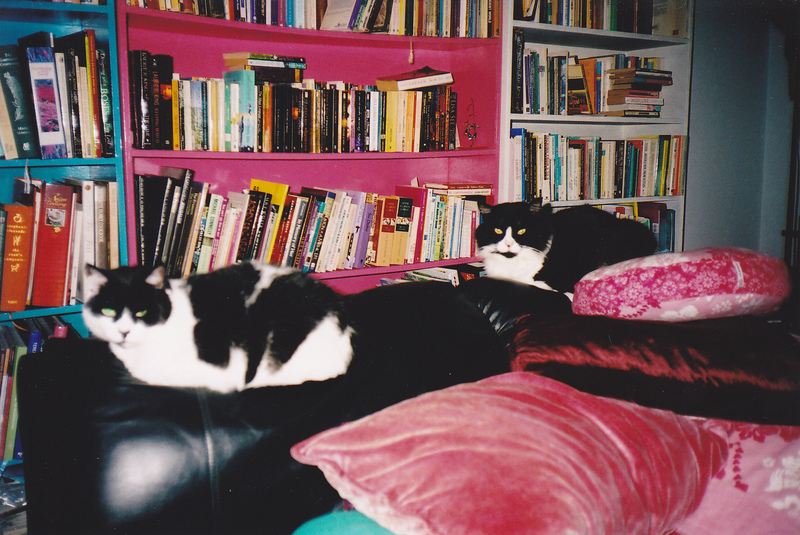 My old house- books and space for cats. This house has big windows and not much wall space. We need bookshelves, so even less wall space. Can you see where I’m heading? Yes, we each have a collection of paintings, prints, photos, tapestries … if it’s difficult to choose between cutlery sets without causing upset, how much more difficult to choose paintings! Thus the unexpected traps of co-housing when each member has abundance, requiring tact and understanding and for each person o be able to let things go. Not only does the rationising of possessions highlight one of the unexpected challenges of co-housing, it also raises the dilemma of disposal. What do we do with them? I do not want to be part of the throwaway society. Use it, get rid of it, add to landfill … our earth is drowning in garbage. Our excess is of good quality; there are people in need. After fruitless phone calls I have given up trying to find some way of getting them to refugee camps, to those thousands in Europe I s huddling in adequate clothing and shelter. But. No one wants my excess. What do I do? A child of the fifties, a teenager in the sixties. A life of change, of learning how to deal with what happened next. My expectations were to get married, have children and live happily ever after. Never happened, in spite of my best efforts. I'm happy, I hope I've learnt from my mistakes and that I continue to change and grow as a human being. If I were to write a post today, what …? a very overdue thank you!